Large Rotary Nozzles are durable metal nozzles that are resistant to wear and provide high distribution uniformity of water. 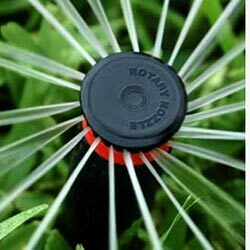 Large rotary nozzles are mostly used on golf courses and other open landscapes for long range and close-in watering. Rebates are per set (8 set minimum – no maximum). Rebates vary by water agency and are subject to change. Click here for a list of rebate-eligible large rotary nozzles. Commercial Rebate Level: $13 per set.